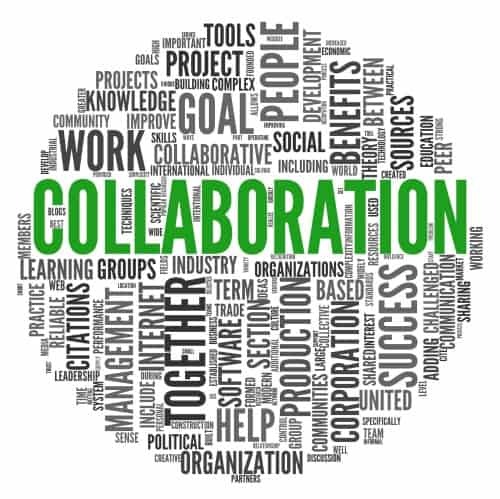 Thou shalt not use the name “collaboration” in vain: We often use the word collaboration, partnership, and cooperation interchangeably, but they actually mean different things. In addition, based on past experience, collaboration may mean different things to different people. When you are starting a group, it is important to define what you are trying to achieve (e.g. common vision), but also to have each party define their definition of collaboration and decide on a common definition for purposes of the group. People often differ on a range of behaviors – informal vs. formal relationship, levels of disclosure and transparency, decision rights (consensus vs. majority), and expectations of effort. While having these conversations upfront may seem tedious, it creates a shared taxonomy and will lead to healthy conversations. Thou shalt add value individually and collectively: As stated previously, the only reason to use collaboration as a tool is that it will add more value to the collective need, but also for each individual. Ask yourself: What does value mean to each individual? Can you quantify it? How do we create value for one another? How can we keep a two-way balance in value creation? The answers to these questions will vary. Some are happy to collaborate, but want their time to be valued, so meeting management will be key. Some will value progress, so an early win will be important. Some want to be acknowledged and appreciated for their role, so celebration and credit are key. Honor thy competition: We think coopetition is something critical for the sector to embrace. The social sector’s natural state is competition (for limited funding and resources) and collaboration is a tool to work together to make the pie bigger. However, in collaborations, we need to go one step further and work on ways to co-exist and create a more productive state. This means we need to adopt the “progress vs. niceness” mentality and communicate with each other frankly about boundaries, culture differences and rules of engagement. Even in the for-profit sector, competitors collaborate – there is a reason Pepsi and Coke are never on sale at the same time at the grocery store. Seek first to understand then to be understood: Borrowing from the late Stephen Covey’s 7 Habits, we often give this advice to our clients. He notes that everyone has their own frame – we interpret (and misinterpret) everything said based on our own experience. To overcome this bias, we need to ensure that we understand the other individual clearly – ask clarifying questions and uncover root causes of behaviors rather than only reacting with our point-of-view. This allows you to have an open mind and will cause the other individual to feel heard. This virtuous cycle will then lead to shared understanding and positive problem solving. You may have noticed by now that we didn’t use a common behavior connected with collaborations – trust. In our opinion, this is the ultimate one needed in collaboration. However, it is achieved through repeated actions and is built over time. We believe that if both sides of the equation (activity + behavior) are satisfied, trust will naturally happen and, if done well, will grow and lead to an even higher form of collaboration. And, once we get it right, maybe we can teach our politicians how to do it as well! As with all our work, we are constantly evolving our thinking based on our work with the social sector, including many of you. We welcome your input as TrendSpotters – positive and constructive on The Collaboration Commandments. Two years we stepped back after reading your “collaboration commandments” and decided we would jump in with open arms. As a result we have established our most successful venture to date from both a financial and impact perspective. Keep posting…we’re reading! I couldn’t be more thrilled. Thanks for your support. These are great. They are not topics that are at the top of my mind and so I appreciate the reminder. Thanks for the article! Trust requires, first and foremost, trust in yourself. When you fully trust yourself, you know when to take a step forward, when to take a step back, and when to wait and pay attention how things unfold. Good article! I just love that connection. Thanks for sharing!